We started thinking about moving further south to Vero Beach, Florida at the end of January. We hear that Vero Beach is very welcoming and is quite a popular place for cruisers. There are two options for staying at Vero Beach city marina, tying up in a slip or the much more economical option of tying up to a morning ball. If we decide to live on a mooring ball for a while we knew we would have to be sure the dinghy and outboard were ready as this would be our means of transport for going ashore for provisions, laundry, water, etc. 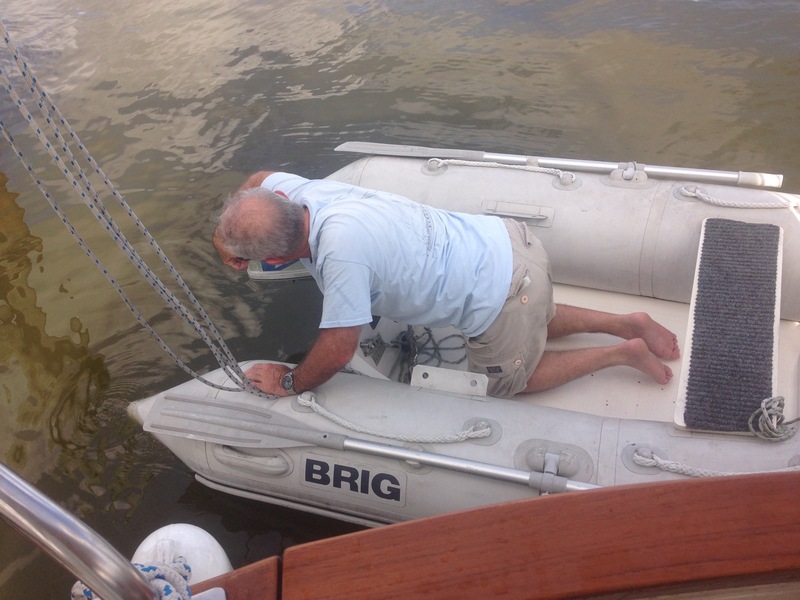 Bob took on the challenge and we lowered the dinghy to the water, and attached the very old 2 stroke outboard. Bob didn’t have a lot of hope of the engine actually starting and we were amazed when it started up easily on the second pull. Woo hoo!!!! But the celebration was short lived as the engine cut out, and after several attempts, a sore arm from pulling, and taking the cowling off to check out the engine’s components the engine would not start again. Those that have chartered with us in the past know that dinghy engines and Bob have an intense love/hate relationship. Recognizing that there is probably a simple fix (water in the fuel line?) we have decided that for the sake of peace of mind and Bob’s sanity a brand new, cleaner burning, more reliable outboard (with a warranty) is in our future. 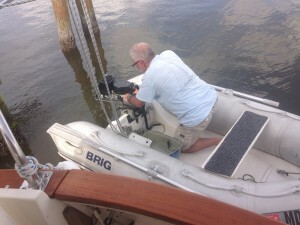 Outboard 1 – Bob 0….for now. We just had to share…. There is a donut shop a block away with the most interesting offerings of donuts. 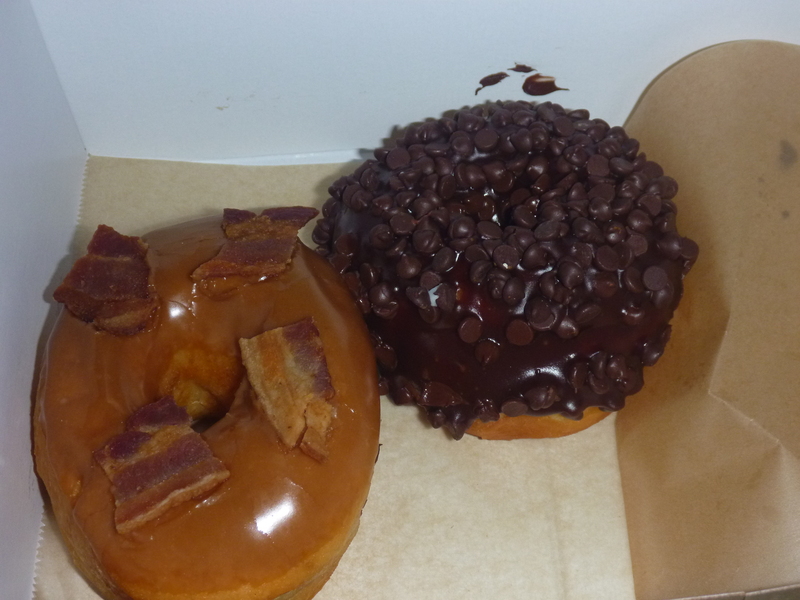 Here is a photo of a maple and bacon covered donut! We had never heard of such a thing. For those that know Bob, you know that Bob does not favor sweets and I don’t think I have ever seen him eat a donut in all the years I have known him. But this bacon covered donut really piqued his curiosity and Bob’s verdict is that it was quite good. It may be hard to keep him away from he donut shop from now on! Christina opted for a decadent yet more traditional offering of chocolate covered with chocolate chips…yummmmy.